Allen & Heath has released a new firmware update for its Qu-16 rackmount digital mixer. Downloadable from the website, v1.2 introduces several new features, including enhanced DAW control, extra processing on mix outputs, processing Libraries and enhancements to the accompanying QuPad app. V1.2 introduces dedicated DAW control, enabling the Qu-16’s custom fader layer to be populated with up to 16 MIDI strips for direct assignment or ‘learning’ of faders and Mute, Sel and PAFL keys in DAW software. Users can also download the free DAW Control app for Mac OS X, which translates the MIDI messages to popular HUI or Mackie Control protocols, for easier setup and bi-directional integration with the mixer. The digital signal processing capabilities of Qu-16 have also been enhanced in V1.2, which now provides the ability to have both 4-band parametric EQ and 28-band graphic EQ on all 12 mix outputs, so that engineers are free to use their favourite equalization tools. The firmware has new functionality for Processing Libraries, whereby users can store preferred channel, PEQ, GEQ, compressor or gate settings for recall or archiving. USB Scene and Library transfer is now available, so that individual Scenes and Libraries can be copied to, or imported from, USB devices to allow easy backup or transferring to other Qu-16s. The global Scene Recall Filter has also been enhanced to offer more options, such as blocking the I/O patch, channel processing or fader levels from scene recall. Also included are improvements in scene management and status information. 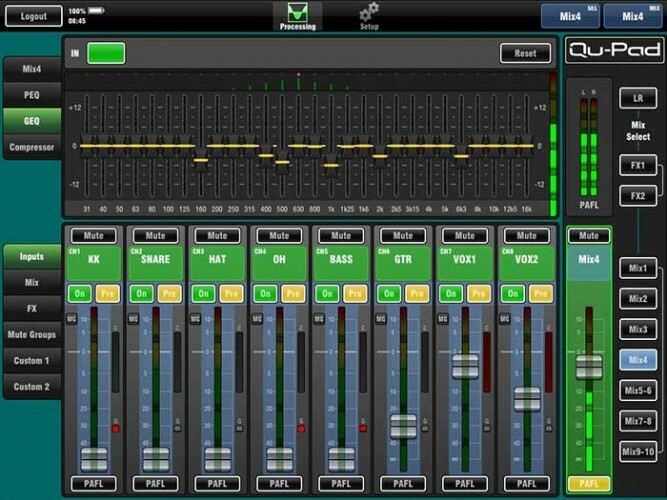 There are also additional features in the QuPad app, including channel naming on the iPad for better channel identification, colour coding for ‘send-on-faders’ views, and added control of Mute Groups and FX tap tempo. "With its processing control strip, touchscreen, and remote I/O, the QU-16 is already the best sounding and easiest 19" mixer to use. The addition of the new features, such as DAW control and more processing, shows that A&H listen to their customers and will make the QU-16 even more enticing for potential users," comments Markus Sinsel, product manager at A&H’s German distributor, Audio-Technica. V1.2 firmware can be downloaded now from the Allen & Heath website. 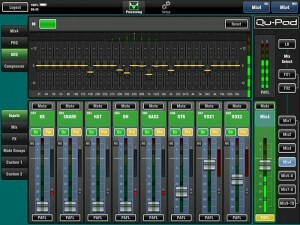 In picture: a screengrab of QuPad, and show DAW control, in V1.2.